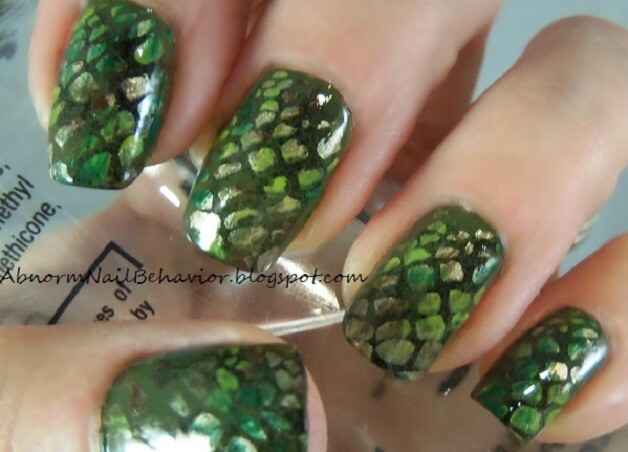 Animal Print! 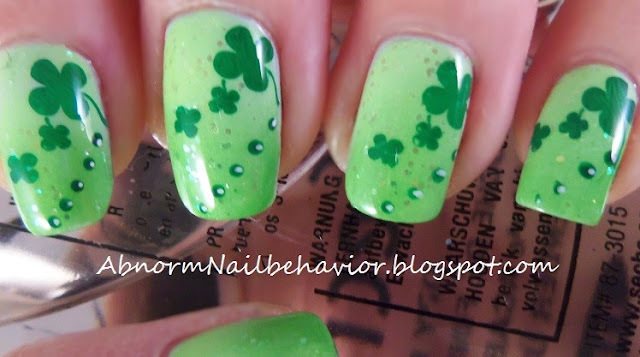 Here is one way to wear green for St. Patrick's Day, even if, you aren't a fan of leprechauns and shamrocks. Step One: Lay down your base coat and allow it to dry (if you use such a coating... 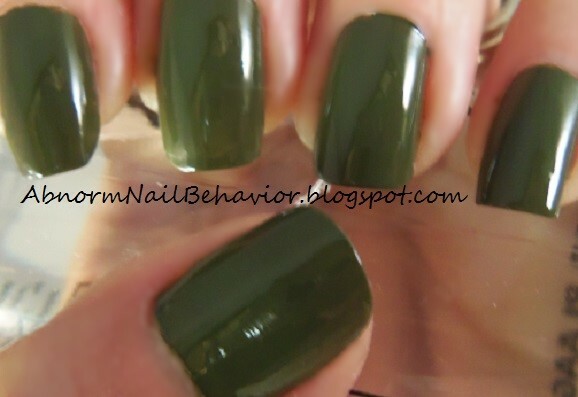 I myself usually do not but green tends to stain) and then start with your green polish. This is two coats of China Glaze Westside Warrior. Step Two: This is purely optional but I think adding a little black gives the final finish more depth. An ordinary cosmetic wedge is my go to for gradients and sponging. I used China Glaze Liquid Leather. It really doesn't have to be a neat application because you are going to cover up most of it when you stamp on your croc skin. Don't be frightened if you notice how textured and gnarly it looks... I promise once you add top coat it will all sort itself out. Step Three: Pick out your scale colors. From left to right I used China glaze Passion, Sally Hansen Insta-Dri Lickety-Split Lime, Konad Special Polish in Brown and in Green. Any combination of crocodile-y colors would work. I picked these because they all work great for stamping and the gold adds a little dimension and shimmer in the sun. Step Four/Five/Six/Seven LOL: There are a few different snake and croc skin image plates out there and this technique works with all of them but I'm using Bundle Monster plate BM-224. (First Plate Picture) Add some blobs of polish to your design in an irregular manner. I start with the gold painting a spot here and there then randomly drop the cream colors over and around it. 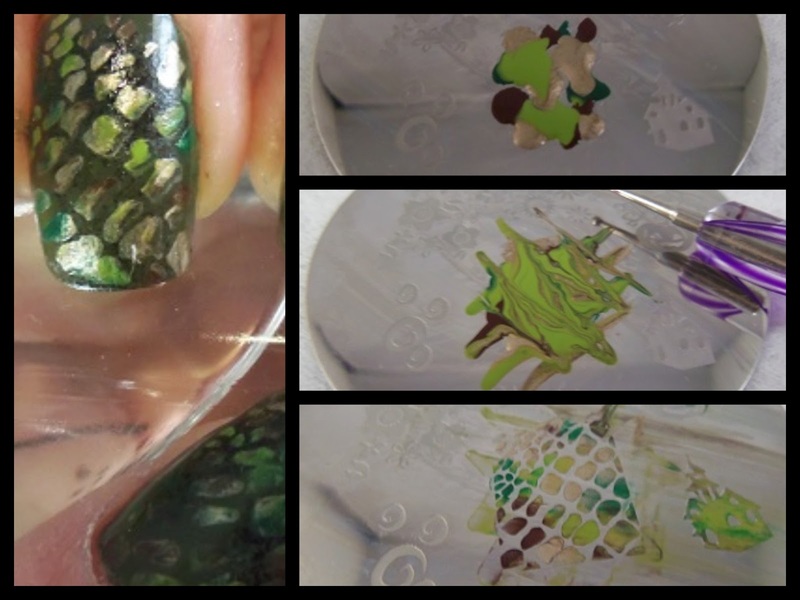 (Middle Picture) Use a toothpick or dotting tool to mix your polishes on the plate. I zig zag one way and then the other just enough to make sure I don't have any big solid blobs of one color anywhere. Work quickly because even though you should have more than enough polish they will dry up on you pronto. (Bottom Picture) Use your scraper of in my case old gift card to swipe the excess polish off your plate and stamp as usual. 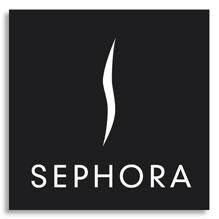 :) Once your certain your design is dry top it all with some Seche Vite or your favorite top coat and viola!